Charlie Kaufman's most recent project, the musical Hollywood-and-robot-heads satire Frank Or Francis, reportedly fell apart due to production issues, and there is nothing you could do about it besides complain on the Internet. But did you know that you can sometimes also use the Internet for constructive things—and, more to the point, to help make sure that Charlie Kaufman's next project actually gets off the ground? Anomalisa, a Kaufman-scripted stop-motion animated film about a motivational speaker who slowly loses his own motivation, is currently seeking backers on Kickstarter, which its production team hopes will allow them to make a film unfettered by a studio system that would never allow you to "enjoy this brilliant work the way it was originally conceived." 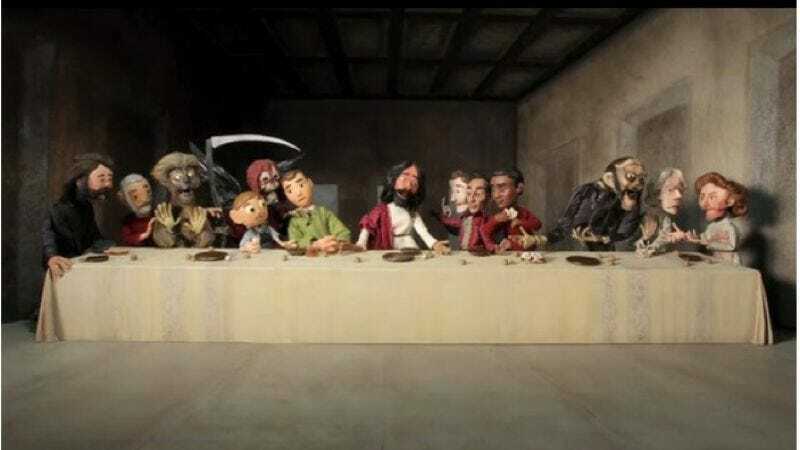 As a bonus, that creative team includes a couple of other cult favorites who have been kicked around by The Man lately—namely executive producer Dan Harmon and his ex-Community collaborator Dino Stamatopoulos, who's bringing along his Moral Orel team of Rosa Tran and Duke Johnson (also of Community's stop-motion Christmas episode). With your help, they'll make Anomalisa totally independently at Starburns Industries—which Community fans should also like—and in return, you can get some pretty interesting prizes, everything from storyboards to set visits. And if you're really feeling generous, $2500 will net you a 20-minute Skype conversation with your choice of Johnson, Stamatopolous, or Harmon (Try to think of something to talk about! ), and, most intriguing of all, $5000 will get you a 20-page custom screenplay written about you. Of course, said script will be written by Dan Harmon and not Charlie Kaufman—so it will be "meta" in a winking, self-aware way, not in a way that makes you want to go fetal with existential despair. Hey, while they're making this project, how often do you think Dan Harmon says to Charlie Kaufman, "C'mon, Charlie Kaufman, some of us have work in the morning"? We're going to guess "hourly."